There are many games that preceded baseball and this is probably one of them. It includes a ball holder shaped like a shoe. The ball is placed on one end of the lever that projects from the shoe. 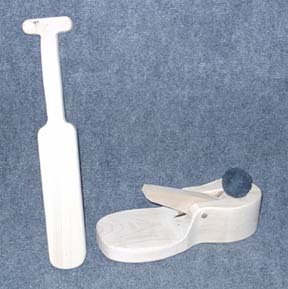 The end of the lever is hit with the bat which sends the ball flying straight up into the air. The player then strikes the ball with the bat. Some rules come with the game but they do mention that the players are free to modify the rules to suit their own tastes or circumstances. For ordinary use or practice, you could use the ball that comes with the set without modification. However, in a historic context, you would probably want to make a different ball of the same size. The ball that comes with the set looks like it is wrapped with electrical tape. A period ball would be made with a packed fiber center and wrapped in rags (making a spare might not be a bad idea in any case in the event that the original ball gets lost). The outer layer of rags could have some stitching to keep them from flying off. The cost of Trapball is $45.00.